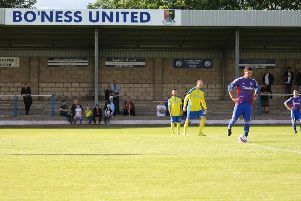 Chris Donnelly’s football career was acknowledged with the best local players turning out to play in a Bo’ness United versus Linlithgow Rose legends match. Chris Donnelly himself stole the show, scoring a hat-trick in a 4-0 success for the B.Us, with the other goal coming from Graeme McLaren. Bo’ness United legend Allan McGonigal took the reins for one last time and he was beaming after a great afternoon at Newtown Park. Speaking post-match, McGonigal said: “It was great to be back in the dugout and it was a super turnout for Chris. “It’s a real testament to these guys and the efforts made to get into shape to come and play for him. Linlithgow legend and all time top goalscorer Gordon Herd was playing for the Rose, and added: “It was a great day, to see somebody with that amount of service honoured. “I know myself what it is like to spend ten years at a club, it takes up a lot of your time and you miss out on a lot of family stuff. Bo’ness: Peat, Snowdon, Hunter, Duffin, Devine, Scott, Walker, Shirra, Hislop, Shields and Donnelly. Subs: Ballantine, Gibb, McFadgen, P. Donnelly, Murphy, McLaren. 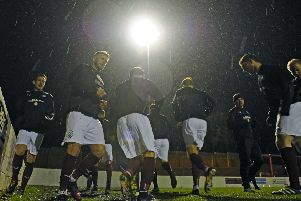 Linlithgow: Pinkowski, Tyrell, Roddy MacLellan, Leiper, Hogg, Smith, Manson, Nimmo, Herd, Allison and Corcoran. Subs: Dickov, Gallagher, Sloan, Ruari MacLellan.